Chris Murphy announces victory at his Waterbury Headquaters on election night, Tuesday, Nov. 2, 2010. On Monday he said he is considering running for Joe Liberman's Senate seat. 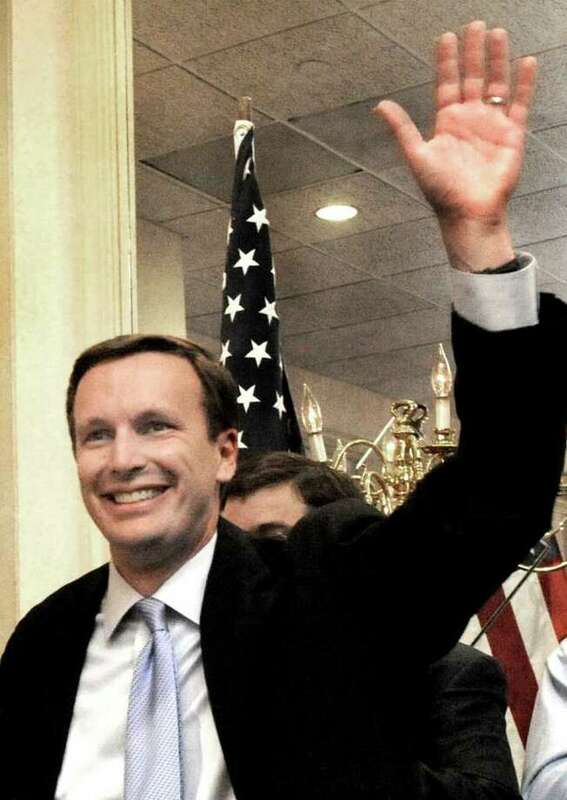 U.S. Rep. Chris Murphy, D-5th District -- fresh from an impressive win in November's election -- said Monday he's considering a run for the U.S. Senate in 2012, the seat now held by Independent U.S. Sen, Joseph Lieberman. "It's something I'll be talking about with my family and the people I trust,'' Murphy said Monday. Murphy said he has no timetable on making a decision on whether he'd make such a run. The main question he's asking himself, Murphy said, is where he might be most effective in fighting for the programs he feels most strongly about, including his "Made in America'' legislation to boost American manufacturing. For the four years he's served in Congress, Murphy has served with a Democratic majority running the House of Representatives. That will change in January, when Republicans take over leadership of the House. Murphy said that is a situation he'll be able to deal with. "Most of the legislation I've sponsored has done with Republican support,'' he said. But Murphy said there's one obvious advantage to being a member of the U.S. Senate, rather than the House of Representatives. "You're serving in a body with 100 constituents,'' he said. Compared to the 435 members of the House of Representatives, Murphy said, the Senate is an easier place to get a message heard. And, he said the U.S. Senate is a "pretty broken place,'' that's been sharply divided by partisan wrangling that has often resulted in legislation that gets endlessly stalled. "Maybe a new voice could help there,'' he said. Murphy isn't the first state member of the House of Representatives to talk about a Senate run. U.S. Rep. Joe Courtney, D-2nd District, has already said that he also is considering vying for the seat. State Democratic Party Chairman Nancy DiNardo said Monday that any of the state's five Democratic representatives could be a viable Senate candidate. Murphy was elected to his third term in the House in November. In a race many expected to be close, Murphy won a convincing victory over state Sen. Sam Caligiuri, R-Waterbury. Whoever does win the Democratic nomination will face a strong Republican candidate, from a list of that could include Linda McMahon, Tom Foley -- the millionaire candidates who ran unsuccessfully for senate and governor in November -- and former Second District Congressman Rob Simmons. In one form or another, he may also have to face Lieberman. Lieberman had been a Democrat, but in 2006 he lost his party's nomination to Ned Lamont. He then ran as an independent, gathering enough votes from Democrats and Republicans alike to defeat Lamont and the Republican nominee, Alan Schlesinger. Lieberman could run again as a third-party candidate. Or he could try to win back the support of the state's Democrats and attain the party's endorsement. However, DiNardo said some of Lieberman's actions -- including his decision in 2008 to campaign for presidential candidate Republican Sen. John MCain rather than Democrat Barack Obama -- has rankled many Democrats in the state. "It probably would be difficult,'' DiNardo said of a Lieberman campaign for his former party's endorsement.